My objective for writing Casualties of The (Recession) Depression, was to raise awareness that, despite the rhetoric we hear (that we are in a “recovery”), millions of American middle-class people continue to experience severe economic hardship and challenges. Hunger, homelessness and joblessness are problems that are not just relegated to the chronically poor — but to a growing number of middle-class men and women, as well. The threat of this class extinction is very real. In this country and in this century, it is abominable that over 50 million people live in food-insecure households (over 19 million are children). Well-respected non-profit organizations, such as Feeding America and (on a global level) The World Food Programme (a division of the United Nations), make it their mission to fight hunger… one person, one household, and one community at a time. But, they can’t do it alone. 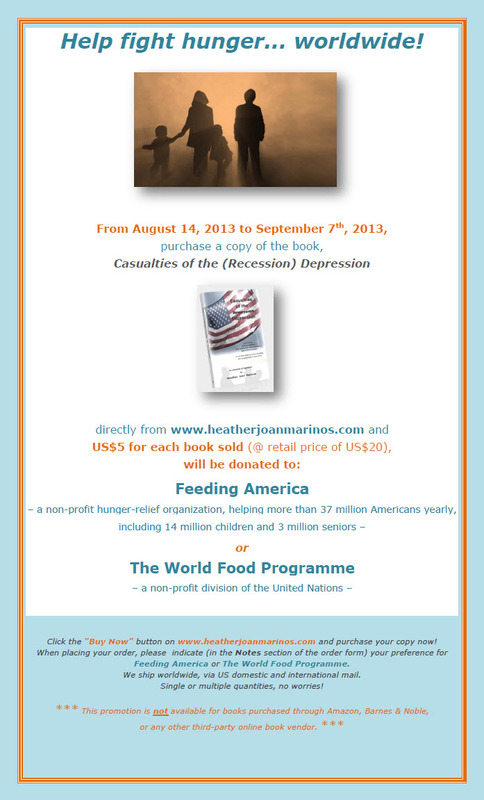 I decided to launch a 3½-week Help Fight Hunger campaign – beginning tomorrow (August 14) at 8:00 AM (EDT) and ending on Saturday, September 7, 2013, at 5:00 PM (EDT) — For every $20 book purchased directly from my website, I will be donating $5 from the proceeds of each book sale to either Feeding America or The World Food Programme (the purchaser chooses). Please read the details below (click on the picture to zoom in for a better read). This entry was posted in Casualties of the Recession/Depression, heatherfromthegrove, inspiration, non-fiction, other musings, visionaries, philanthropists & sheer brilliance and tagged American Middle Class, books, Casualties of the (Recession) Depression, economic crisis, economy, Feeding America, Fight Hunger, Heather Joan Marinos, heatherfromthegrove, Help Fight Hunger, homelessness, Hunger, joblessness, John F. Kennedy, non-fiction narrative, Nonprofit organization, political and economic commentary, United Nations, United States, World Food Programme. Bookmark the permalink.